There have been exactly two afternoons in the past two months and two weeks (because yes, I still count in months and weeks; this is what mothers of newborns do, remember – or should do in a world where nature does not betray and babies do not die) when my despair has been tempted to fling open the front door and scream at the top of my tired lungs that the world has forgotten us. On each of these afternoons – and I cannot explain this – I have tripped over a package on the doorstep. I have calmed down enough to sit on the stoop next to a white USPS package with a return address I did not recognize. And I tore open its top to unwrap something rare and beautiful from an almost-stranger. Each time this surprise has sprung forth gut-felt gratitude, wet with tears. You guessed this much. But not for the reason you think. Because each time that package was not a thoughtful token of a single someone’s affection. No. It was the fullness of Everyone. Every single one of you, stranger or neighbor, who have loved and held and prayed and carried us along this sorrowing, stumbling way. I understood this truth instantly, universally, with a jarring clarity that cuts into memory and opens up something deeper. As if I could feel, on each darkening afternoon when my toe dipped down to the coldest point of despair’s pool, the rushing force of Everyone pushing me right back up to the rippling surface, leaving me gasping but breathing again. This is what I am trying to understand. There is a wideness. When we escaped to the cabin last weekend – and the choice of verb is deliberate, because even a simple spring day for mothers was too much for me this year – I could not stop searching the horizon. Always the great lake seizes me. It is the longest reflection of sky and water that I know. Its embrace is intimate as a wide, wet womb. But this time it was only the horizon I yearned to discern. Grateful when fog first blurred the other side from my sight, because why the hell should any horizon dare to be crisp and clean anymore. But softened when I started to see again – when the haze burned away and I could make out that there was beyond, as there always was. And that it was still beautiful for its promise of another side, defining where I stood as much I as shaped its opposite shores. I feel God’s silence in this lake in the holiest way. I cannot explain how its waves make my life make sense. How its hidden depths reassure me of ancient mystery. How every time I have doubted my place in this life I have found something of truth again in the rocks at its edge. There is an expansiveness of God that makes the smallness of my life settle into place. There are not words enough for this. But there is a wideness. When Maggie died, I felt her soul expand. Between one moment and the next, I realized that her life was no longer contained within the tiny body I held in my arms. The fullness of her – no longer an infant, not even a child, beyond an adult – was suddenly all around us. I knew I could not see it, but still my eyes searched each corner of the ceiling, so thick and real was her presence. It was the fullness of a whole human life, wrapped around us in that space. I cannot explain it any other way. When we held her sister the next day, Maggie stayed there, too. And then in the same faint shift of one small second to the next on the hospital clock, Abby’s soul was no longer held within her body or the bundle of blankets or our cradling arms – but beyond, above, elsewhere, united, embraced, expanded. Their lives were together in their fullness, right around us. I know you cannot read these words (and believe me, it is much harder to write them) without slipping into sentimental or spooky territory. Forgive the limits of letters; there are only 26 slim ones in our agreed-upon alphabet, and I cannot contort them to capture what I am trying to convey. What I mean to say is that we cannot wrap our arms around this. We do not even have to try. Stunningly beautifully written, as always. We feel their spirits in our family, too, to risk the spooky sentimentality. Their holy card above the toaster oven, their names at the end of each meal prayer, the joy they bring my kids by merit of their Heavenly reward. One of the beautiful gifts of our faith that I have learned to appreciate even more through our many losses is its constancy. I am a convert, and it makes me even more aware. The rhythm and beauty of the liturgy is like the heartbeat of the Church. During the many times I wasn’t sure if I could get out of bed and face another tomorrow. During the many times it felt like the entire world should stop rotating because in my mind it had. The Church continues. With her liturgical year and cycles. Just as the morning turns to night and night to morning. Just as the seasons change from one to the next and back again. It helped me to realize that tomorrows will still happen and gave me the grace to accept them and eventually embrace them again. the wideness of Maggie and Abby. there is a chaos in the wideness. it becomes eschatalogical. time does not exist in this wideness. there are moments where i feel that i met, that i held Maggie and Abby. then i remember, in the wideness, i met them in their brothers, when i walked through the door to your home, in your embraces, in your tears and in your laughs, in your silences and in your rages. all of this is holy. all of this is wide. all of this is… thank you for always being so honest and authentic to your words. Beautifully written. There is a widened we cannot wrap our arms around. We don’t even have to try. Yes. There is a spiritual reality as real — MORE real — than the tangible physical reality. Yes. There are moments in life when we get tiny glimpses of this reality that exists in this plane beyond the power of description. Words may fail, but it does not make it less. I have read very little writing in my life as beautiful as yours has been since the death of your daughters, Laura. I don’t mean that as an attempt at consolation, but as proof of the Spirit’s nearness to you right now. It’s breathtaking, and we’re all drinking it in. Thank you, again, for continuing to write so that what they’re meant to teach us will live on. “Forgive the limits of letters; there are only 26 slim ones in our agreed-upon alphabet, and I cannot contort them to capture what I am trying to convey.” Wow, I don’t know that I have ever read such beautiful words. On going prayers for you and yours. Laura, thank you for your writing, and for this piece in particular. It reminds me of something Karl Rahner wrote about (it seems to me) that wideness to which you refer, and the difficulty he also admitted in expressing it. 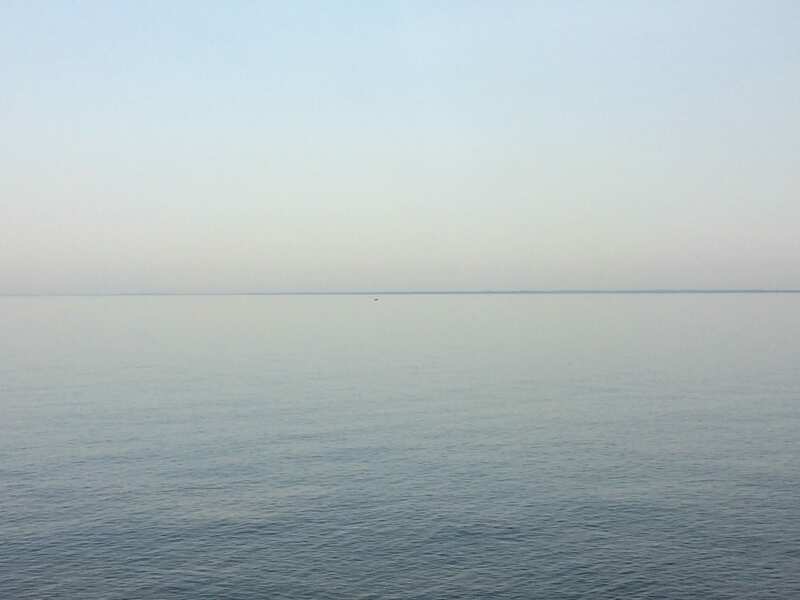 I write now because I am wondering whether you’d give me permission to use your photo of the great lake in creating a sympathy card for a friend?